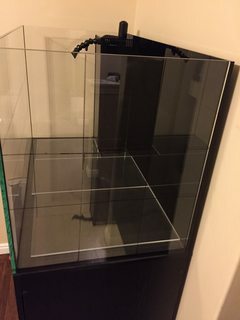 I just wanted to document my latest tank build as I am putting it together. Since pictures speak louder than words, I will try to have more pictures than words. I am planning on drilling the rock with acrylic rods so that the rock sits just above the sand. 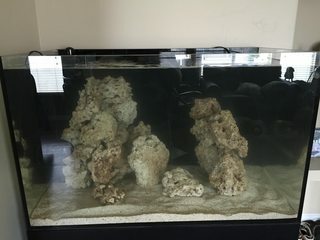 I put these acrylic sheets that I had lying around on the bottom to try and help distribute the weight from the 1/2" acrylic rods that will be in the bottom of the base rock (3 rods per base rock). Love this tank and foot print! I look forward to seeing the outcome. Looks like a great setup! I put my rockwork all into place over the long weekend and even put some epoxy in place to help hold the structure intact for when I start putting critters in here. 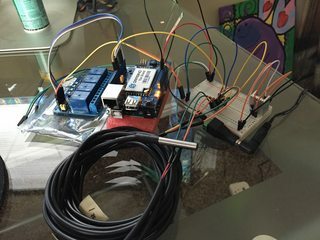 Then I finished fixing writing some code for my arduino that I am going to use to help monitor/control the tank. 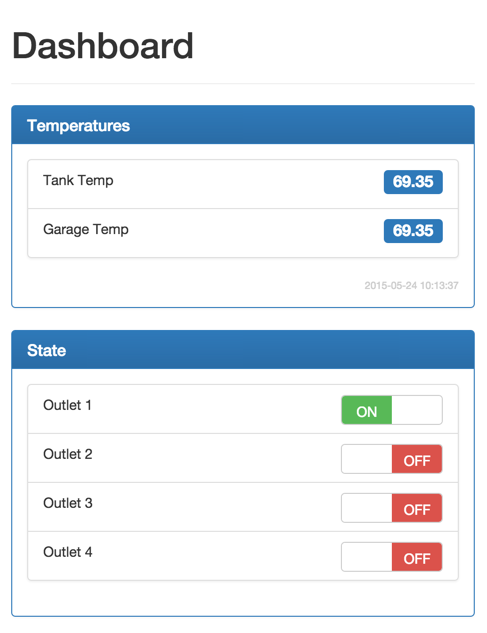 Here is the interface that I created for the arduino to help tell me what the current tank temp is, turn on/off outlets by pushing a button and to auto turn off the heater outlet if the temp goes above a pre-determined temperature. I cycled my rock in the garage which is why the dashboard says "Garage Temp" it will turn into "Room Temp" once it is in its enclosure (TBD also) and running on the tank. - Need to find a way to mount my LEDs above this thing. I am trying to determine if I want to build a fixture or if I should just build a mount. I am trying to find some good DIY builds that look good so if you have any advice I would appreciate it. If I can't find a good way to do this I may go with a LED+T5 fixture that is out on the market (TBD). The plans for this week are to monitor the params and hopefully have a quick cycle. Wanted to give a quick update. 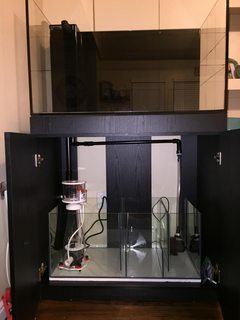 I had a couple of Hydor Koralias in the tank but wanted something a little better so I picked up the Gyre XF-130 From Aquatic Dreams and put it in place. This thing is awesome! I am currently running it in alternating gyre mode for 30 minutes per direction at 30%. I will turn it up once I have some livestock in the tank. 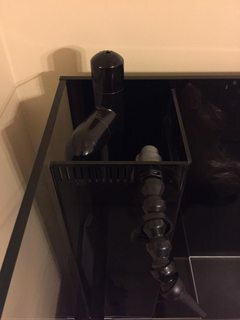 My skimmer has been bubbling over and going crazy even when the output is wide open so I cut some 1" pvc into 2" lengths and put those under the skimmer and now it is working much better. This weekend I am planning on building a "control center" cabinet that will house all things electronic and it will sit next to the tank. I am doubtful that I will finish it this weekend, but I will post the progress as it happens. 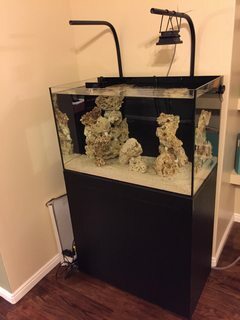 I have also decided that I am going to be upgrading my return pump because I am not getting the turnover that I want from the display tank to the sump. I am thinking about getting the eheim 1260. I feel like I got quite a few things done with the tank over the weekend. I made a DIY Float valve holder, bent my light holders, mounted them in place (using command strips and zip ties so we'll see how they hold) and got all of the wood for my "electonics" cabinet cut, sanded and prepped for placement. 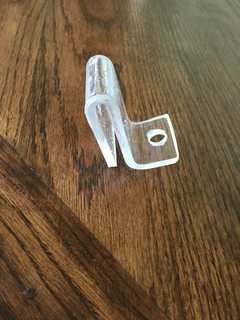 Float valve bracket that I made by heating up some acrylic wit ha heat gun and then drilled a hole. Went to Home Depot and bent some 3/4" conduit. 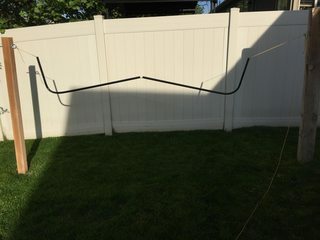 Used a 3m scotch pad and roughed it up then strung it up between my hammon posts and painted it black with many coats of leftover krylon black paint. In this picture you can see the vertical pipes coming down, those are the light posts. I drilled a hole in the backboard of the stand and fed the water line though it and down to the water clamp thing I made. The water line helps hold pressure on the clamp and keep it in place and pressed down. This was a test fit for the lights, and I absolutely hate how messy the hang kit I made looks :(. Any ideas on how to hang the lights from the posts without them looking messy (I zip tied the led light cord onto the tube but it is just temporary so I didn't cut the tails off the zip ties. 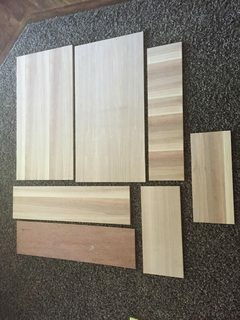 all of the wood pieces for the electronics cabinet. I am going to work on cutting out the outlet holes today and the only other thing not picture are the cleets that will hold the back into place so that I can easily remove that panel from the front of the cabinet. - False back wall that will hold all of the outlets. 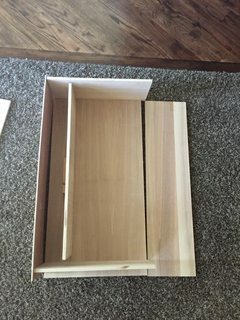 Sample fit so that you can see how it will go together. The gap below the false wall is intentional for ventilation. I am going to be making some slits in the backboard of the cabinet too. I'm loving that, looks good! to clean up the hanging kit i would suggest using an eye bolt and some cables with carabiners on them. Thats what I used. It allows a pretty clean look. You can check out my build, i think i have a picture of my light hanging fixture. its pretty similar to yours. 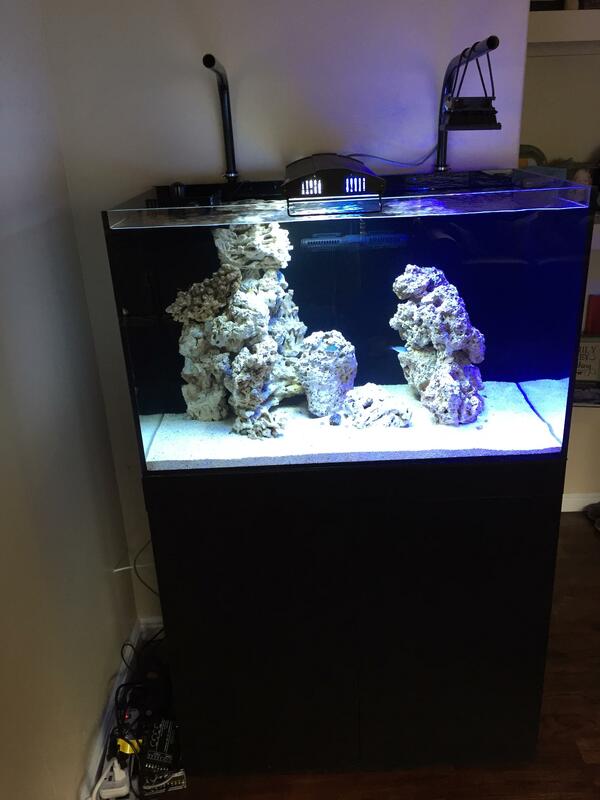 I wanted to post a quick update on my tank, it is going well I'm still waiting on the other light so I have put a little T5 light for now. I added a small frag of pom-pom Xenia and a mushroom, both of those have done amazing. All of my levels seemed to be in check. The crabs and corals have been doing great and the copepod population is all over the glass so I added a couple a blue chromosome today. If they look good in a week and my params test out I will add some more coral. 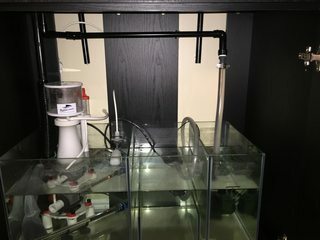 Its hard to tell from your images, but did you upgrade/use a new return pump? I want to upgrade, and know that the plumbing is kind of funky with Cadlights. I did upgrade the return pump. I found a pump locally that I know is overkill for this, but the tubing is restricting it down and making it do a pretty good job. I am definitely seeing more items go into the overflow than I previously was. As a quick update. I added a BRS media reactor this week. These things are pretty awesome. 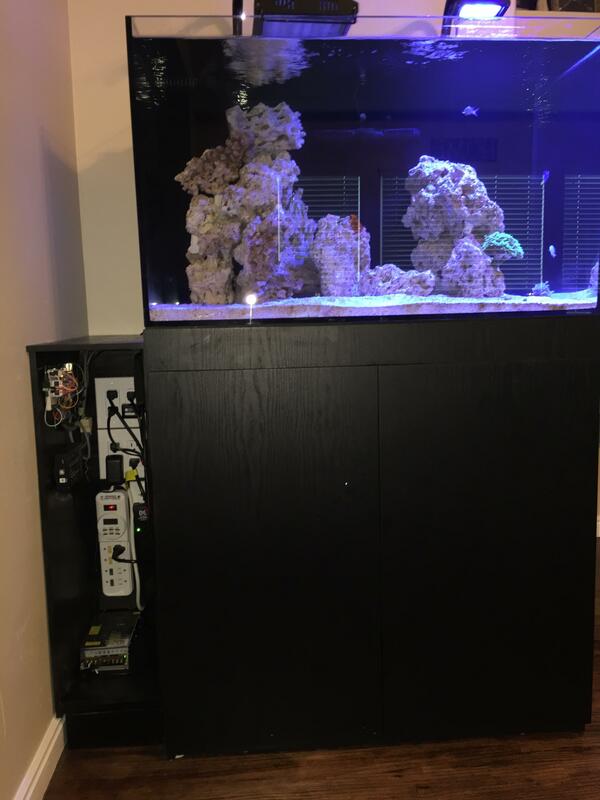 I am just about done with the electronics cabinet that will go next to the tank. 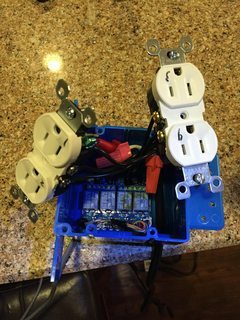 I decided that I wanted 8 controllable outlets so I ordered another relay ($7) and once I have that wired up I will be putting everything together and will take a picture of the finished product and put it on here. I added a few blue chromis 2 weeks ago when all of my parameters hit 0 and then this weekend I added a Flame angel and a few corals. I am going to test my levels again in a week and see what they look like. So far everything is looking good. Side Note: These bubble magnus skimmers are amazing! Even when there weren't fish in the tank it was pulling out some pretty nasty skimmate. Thank you. Thats awesome. I do want to upgrade my return too. I have a Cadlights as well. Excited to see the progress on this project. 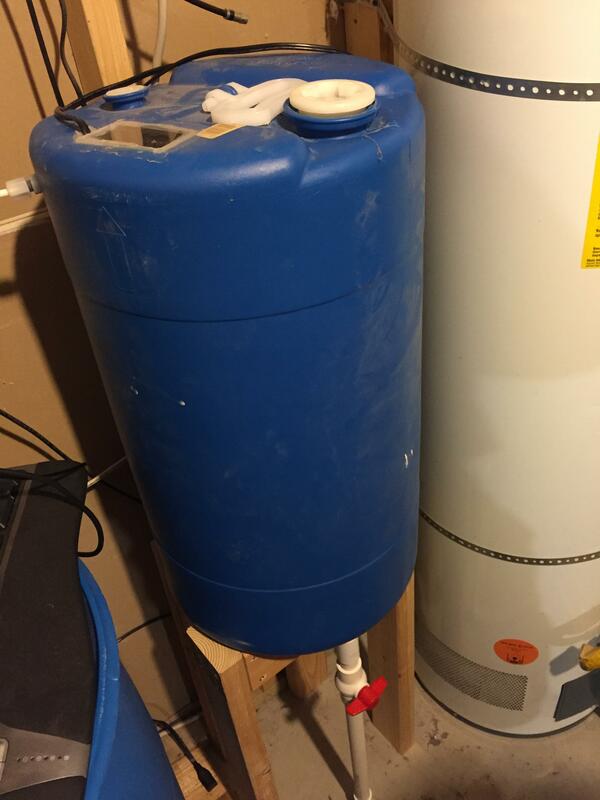 Got my 15gal water jug hooked up to the RO line with float valve so that I have 15gallons of RO/DI on hand at all times. I have left an unattended RO line on too many times so I knew this was a necessity for me. Here is my Pom Pom Xenia - It has recovered nicely after making friends with a pump a couple weeks ago. I will have to bust out a better camera than my iPhone's once these start looking better ;). I also forgot to mention that my magnafuge showed up. You can see the magnet in the tank with the shot of the return pump (Eheim 1262). The electronics cabinet has had a small amount of progress. I am 90% done with it and should finish it this weekend. I have however been fighting a bigger problem. I keep getting a build up of scum on the surface of either the display or the sump. I decided to try my hand at the DIY Filter Sock using the polyester felt and we will see how well it does. This was one of the items that I was originally concerned about and why I upgraded my return pump. This is a shot from in the tank looking up. You can see the "milky" look of the surface. I have found that the overflow design is actually the culprit of this. 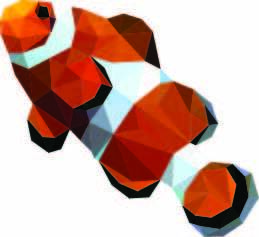 The slits are too thin so it creates surface tension and items on the surface don't go through, but the underlying water column does... at least this is how it appears. I tested my theory by "flooding" my tank. I put an attachment on the overflow that eliminated the overflow box and all of the surface film was gone in about 30 minutes. I made sure to catch it all in a filter sock this time, because up to this point it all ends up back in the display. I am still waiting on my other light... and I was impatient so I ordered all of the parts to build another pendant. Looking nice. I am unsure of what the problem is, but if flooding it as you say worked, could you just point the Gyre up a tiny bit to break the surface of the water slightly? I have one and I have it slightly pointed up so it creates a small bubble on the surface. Finally finished my electronic cabinet!! This was way more work than anticipated. For those that are curious all the wires in the top left are from the arduino and the bread board. It controls the outlets individually from my web interface. I wanted to post a quick update. I just got some new lighting because I wanted something a little brighter than the LED fixture that I have. 24" 8 bulb ATI dimmable sunpower. Fedex delivered this to me on my birthday. I also stopped by A reef Oasis and picked up some davinci clowns, a frogspawn and an anemone. I will post some pictures once I get these new lights hung. I have this light and love, love, love it! !